Launched in May 1939, the TB did not look anything different from the TA and it was not until the bonnet was opened that the differences became apparent. However, there were some cosmetic changes externally, with the wire wheels now becoming centre laced as opposed to side laced on the TA and the semaphore type traffic indicators that were evident below the windscreen pillars on the TA were dropped on the two seater TBs but retained on the drophead coupes. The bonnet side panels had different sets of cooling louvres and the nearside panel sported a bulge to accommodate the large dynamo associated with the new XPAG engine. The hood had distinctive twin slots in the canvas forming the back windows; these however proved not to be very successful as the rearward vision was quite restricted. It was during late 1938 and early 1939 that the XPAG engine was developed. It was a totally new engine with a fairly high state of tune and featured an enlarged cylinder bore of 66.5mm giving a capacity of 1250cc, which was down 42ccs on the TA engine. Despite this drop in capacity, the car ended up in the next taxation class going from to 10 to 11 horsepower. This was a direct result of increasing the bore and the car became a victim of the somewhat ridiculous horsepower formula. Making its first appearance in the TB, the XPAG engine would power almost every MG car and many special racing cars for the next 15 years and MG could not have foreseen that the engine would prove so successful, particularly with the Gardener MG that achieved over 200 mph. Phenomenal power outputs were achieved with the XPAG engine, particularly when supercharged and though it resembled the MP JG engine in as much as it was an overhead valve pushrod unit, that is where the similarity ended. The TB engine was altogether more appealing to the MG fraternity because it was capable of far more tuning than the old TA engine and was much more reliable into the bargain. Everything the TA engine lacked, the TB engine had in its favour. It had the larger bore of 66.5mm against 63.5mm and a shorter stroke of 102mm against 63.5mm, thus allowing faster and safer high revving. Maximum power was achieved at 5,250 rpm against 4,500 rpm of the MP JG unit and the output was a healthy 55 bhp. With the shorter stroke, there was some loss of torque but this was more than compensated for with a lower back axle ratio changed from 4.875:1 to 5.12:1. This extra power and higher rev limit ensured that there was no loss of speed at the top end of the range and the car performed well in the 55 to 70 mph area. The acceleration was marginally improved over the TA with a 0-60 mph time of 22.7 seconds which was nearly one second faster. Because the XPAG engine had a stronger block, more efficient cylinder head and stronger counterbalanced crankshaft, the engine was far more receptive to tuning than its predecessor and with a far lighter flywheel the engine was altogether more responsive to accelerator movements. Developed from the Morris 10 engine, the XPAG was specially produced to power the TB. The main new features that were introduced on the MG version were greater rigidity in all moving parts, the already mentioned stronger block and crankshaft, short connecting rods with centre lengths less than four times the crankshaft radius, light alloy Aerolight pistons, shell bearings, larger valves with the inlet being 10% bigger than the exhaust, large capacity oil sump with a full-flow filter system and finally a four branch manifold that fed into a Burgess straight through silencer system. An immediate recognition point under the bonnet was the repositioned air cleaner arrangement. This was horizontally mounted on the TA at the rear of the cast alloy inlet trunking, whereas on the TB it was now mounted transversely on a revised alloy inlet with its top end resting on the rocker cover. The cooling system on the XPAG is worthy of mention because it was due to the design of the system that allowed the additional performance to be extracted from this now legendary engine. A rather ingenious flow system ensured that the block ran warmer than the cylinder head which was ideal for performance and also kept the mechanical wear down to a minimum at the bottom end of the engine. This is how the system worked; there were more than adequate water passages around the valve seats and the cooling water was directed particularly towards the cylinder head, through a pipe on the manifold side of the block and then to the back of the head. The water pump flow was therefore almost entirely channelled through the cylinder head, however there were water passages drilled through between the head and the block so that the block received mostly static water and it therefore ran at a slightly higher temperature. The original fan and thermostat system of cooling was retained from the MP JG engine with waterways introduced between the cylinder walls, all of which aided mechanical efficiency. A Borg and Beck dry plate clutch replaced the oil bath cork plate variety that had been commonplace on so many previous cars. There was also a new gearbox which was also employed on the VA saloon, with synchromesh on 2nd, 3rd and 4th instead of just the top two gears, but still in the same familiar casing. The gear ratios were also altered to cope with the lower rear axle ratio and these new ratios gave a road speed of nearly 16 mph per 1000 rpm which produced a very comfortable cruising speed of over 65 mph. An additional feature was the provision of a telescopic steering column which now became standard and was adopted from the TA drophead coupes as was the smaller capacity fuel tank, now reduced to 13 gallons to accommodate the wider TB rear wings and slightly narrower body. There was no doubt that the new engine and gearbox did wonders for the TB, making it so different from its predecessor, although the TA was extremely popular with trials competitors because of its better torque characteristics and it was the TA that paved the way for the now legendary MG T series cars. The TB enjoyed a very short production life and when war broke out in September 1939; all MG production was brought to a rapid halt. In fact MG's model programme for 1940 was only announced after war had been declared and this meant that no sooner had the public been informed about the TB than they were unable to purchase one. In the four months of TB production only 379 cars were made. The Abingdon factory was cleared of all car components and was turned over to munitions work as soon as was humanly possible. Very soon, aircraft pressed components, machine guns, overhauled tanks and army trucks were seen to be leaving through the factory gates instead of SAs, VAs, WAs, TAs and TBs. In 1941, Cecil Kimber secured a contract to make part of the Albemarle bomber aircraft, but this unfortunately was done without the prior knowledge and consent of the Nuffield board, which sadly resulted in the dismissal of Kimber. Tragically, Kimber was killed in a freak railway crash at Kings Cross station in February 1945 and without doubt MGs would not have enjoyed the respect and good reputation that the cars still enjoy to this day, without his enthusiasm and guidance. After 6 years of war, the Abingdon factory returned to sports car production under the leadership of a new director, H A Ryder, who immediately struck up a good rapport with the slightly demoralised staff who were still reeling from the death of Kimber. 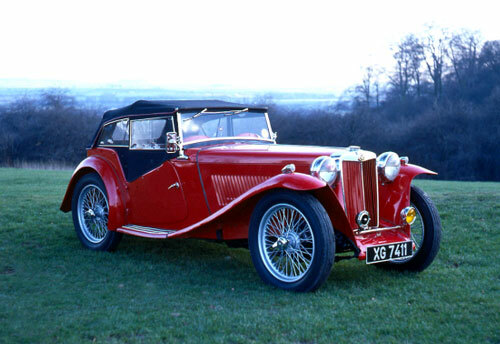 It took just six months after the war ended for MG to come up with a replacement for the TB and even in the post war depression there was an anxious market looking for an improved version of the prewar cars. Hence the MG TC was born and in essence it was only a slightly revised TB with wider body and-other minor modifications and improvements. The TC certainly looked the same, with its general layout, styling, performance and handling almost identical to the TB, however this did not matter at all to the sports car buying public and the TC sold extremely well indeed and was billed as a post war sensation. Price new: £225 for the 2 seater. £270 for the Tickford coupe.